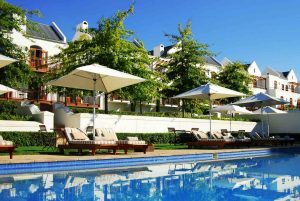 The stylishly decorated 47 rooms and suites of the De Zalze Lodge are set alongside the first fairway of the championship. The clubhouse is just on the other side of the Blaauwklippen and within walking distance. 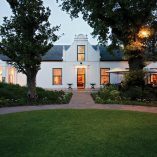 The rooms at De Zalze Lodge enjoy breathtaking views of the Stellenbosch Mountains and are surrounded by 120 hectares of vineyards. Guests can enjoy a full or continental breakfast overlooking the first green while being shaded by old oaks. 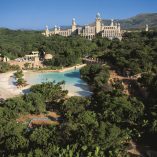 Accommodation is available in a variety of units: two bed roomed family suites, one bed roomed suites, superior rooms and standard rooms. 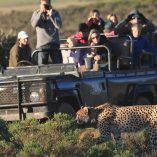 Although De Zalze Lodge offers all the comforts associated with a four star facility, the rooms are available with kitchens or kitchenettes, complete with microwave, and cutlery and crockery for those who prefer to self-cater. 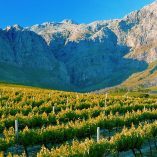 There’s a rim-flow swimming pool, a range of vineyard trails for hiking or running, mountain bike trails, as well as wine tastings and cellar tours. In addition to 24-hour security, all accommodation, both suites and individual rooms, are air-conditioned, fitted with under floor heating, satellite television, internet access, room safes and even European wall plugs. 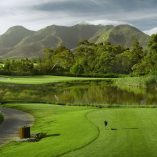 Golfers can indulge virtually on the spot at the De Zalze Golf Course – one of the Cape’s finest venues – and continue at a range of other top-ranking courses in the Winelands and beyond.